Patients are typically admitted on the day of the surgery, after a suitable organ is offered. A surgical team from Montefiore travels to the donor hospital to procure the donor liver from the brain-dead donor, or the liver is sent to Montefiore from another city after another surgical team retrieves it. The Liver Program team assesses the donor liver carefully to ensure that it is suitable for transplantation; this may include a review of biopsy results and other data. If the liver is determined unsuitable for transplant, the transplant operation may be cancelled and the patient discharged back home to wait for the next liver offer. During liver transplant surgery the surgical team at the Liver Program always includes two senior liver transplant surgeons who perform the operation together with an experienced team of nurses and technicians. No residents or fellows perform the surgery, although trainees may observe the operation or provide an extra pair of hands to assist. In addition to the surgical team, an experienced liver transplant anesthesiologist is always present during liver transplant procedures. The liver transplant operation is performed through an incision in the upper abdomen. Most liver transplant operations last for four to five hours. An additional one to two hours is required for general anesthesia, placement of special intravenous catheters and monitors, and transport of the patient to the intensive care unit, where all patients recover after surgery. Blood products (red cells, plasma, platelets) are often required during liver transplantation, because of the large size of the operation and the poor blood clotting (coagulopathy) that affects most patients with liver failure. 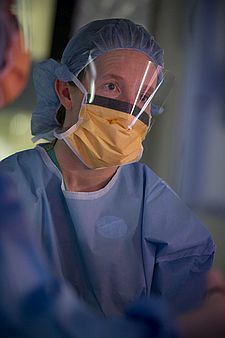 Whenever possible, the operating room team seeks to minimize transfusion of blood using specialized blood conservation techniques like Cell Saver, which is a system to recycle blood spilled during surgery.